Abbey period radiator valves are a popular traditional decorated head radiator fitting for our cast iron radiators. 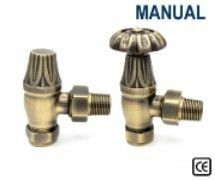 The Abbey range of radiator valves are designed to be the most versatile traditional style valves you can find. Each type is capable of being installed on existing heating systems, they are also available in a thermostatic range.